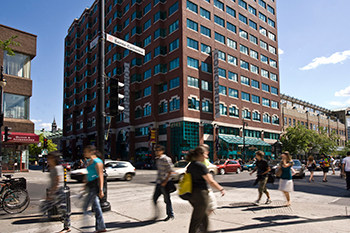 matralab is located in the Faubourg Tower Building, Concordia University at 1250 rue Guy (corner of Ste-Catherine). The room number is FB 630.17. The FB building is on the southwest corner of the Guy/Maisonneuve crossing – a red building with green fixtures (The one with the Second Cup in it). The access to our part of the building is an arch-like entrance on rue Guy. In the lobby, you will see many elevators ahead, but also four elevators in a niche on the left side. They do not all go to the same floors. You take the elevators that go to the 6-10th floor. When you step out, turn right – there is a glass door. Next to it is a silvery doorbell – press it. Wait for someone to let you in. ROOM FB 630.17 is the last door in the second hallway to the right. IMPORTANT: Always make sure someone is present to let you in. Make an appointment or call ext. 3187 before you make your way there. The new office that was assigned to us is in a restricted area. No walk-in visits ! 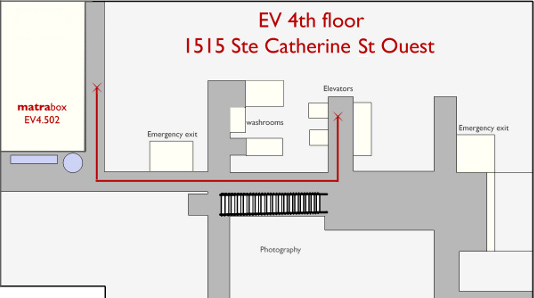 The matrabox is located in the EV building, Concordia University at 1515 Ste-Catherine St Ouest. Go right after the metro turnstiles. Through the revolving door and up the escalator. Near the Mackay Str. exit, after the stairs, you will see an elevator niche on your left. Just before the pillar, turn right into the passage. matralab is the last door on the left. Just after entering by the Mackay Str. entrance of the EV building, you will see an elevator niche on your right.